Just a reminder. It appears leftist militants are still planning coordinated nationwide riots on July 2nd and 3rd, called "Impeachment Marches". 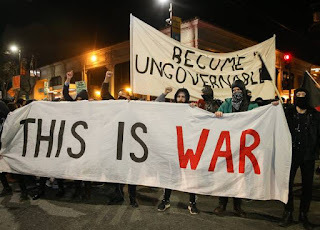 Thousands of street 'activists' will be using flash-mob and other methods taught at Summer Resistance Camp, generously funded by the The Democratic National Committee. Expect Black Lives Matter and armed Antifa red brigades to use demonstrators as a screen for serious assaults. Their leaders have refused to rule out property destruction and violence against unwelcome bystanders. Persons of non-color who are unlucky, elderly or merely slow moving are at particular risk. The central theme is, "Trump must go by any means necessary", starting with shutting down entire cities. As happened in Baltimore and Berkeley, city officials—co-conspirators, to say it plainly—may order police to retreat or even to stand down, then when things quiet down, send 'em out to arrest the victims. As always, observe Ol' Remus's Most Excellent and Inviolable Rule One For Survival: stay away from crowds.